Three men and three women make the last cut; only one of the nominees is from California. BRISTOL, Rhode Island—U.S. Sailing announced its six finalists – three men and three women – for the 2018 Rolex Yachtsman and Yachtswoman of the Year award, Jan. 11. The finalists are Zeke Horowitz, Jud Smith, Will Welles, Carmen and Emma Cowles, Daniela Moroz and Paige Railey. Moroz is the only finalist from California – she’s a foiler and kiteboarder from Lafayette, a suburb of the San Francisco Bay Area. Those in the running of the annual award are considered to represent the sailors the United States has to offer. 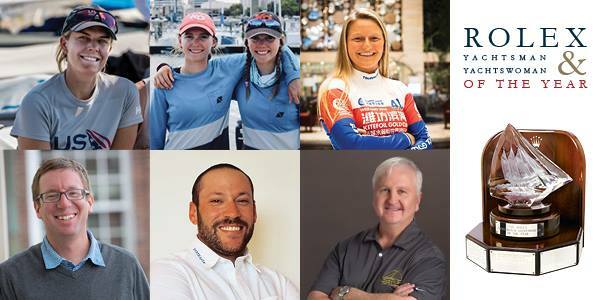 “All three Yachtsman finalists earned their way on to this exclusive list by winning a J/Boat World Championship in 2018 and are seasoned veterans in the sport, battle tested over time,” a U.S. Sailing statement on the finalists announcement said. “The three Yachtswoman finalists represent a combination of the youth movement currently taking form in the U.S. sailing circuit and a two-time Olympian on the comeback trail. “All six of these sailors represent their own unique pathway to the shortlist after a triumphant season on the water in their respective boats,” the U.S. Sailing statement continued. U.S. Sailing described Moroz, the sole finalist from California, as a “blue chip foiler.” She won Women’s Formula Kiteboard competition, for the third time in a row, at the Hempel Sailing World Championships in Aarhus, Denmark. Moroz is also the world’s top-ranked kiteboarder; she won the most recent IKA Kitefoil World Championship in Cagliari, Italy. Railey, who hails from Clearwater, Florida, is a two-time Olympian and winner of the 2006 World Sailor of the Year. She was also awarded the Rolex Yachtswoman of the Year title in 2006. Her most recent finishes on the water were at the Laser Radial European Championships in La Roche, France (second place) and World Cup Series Hyères in Hyères, France (third place). Twins Carmen and Emma Cowles of Larchmont, New York, claimed a gold medal at the Youth Sailing World Championships in Corpus Christi, Texas (women’s I-420 double-handed dinghy event). Other 2018 honors included a third place overall finish at the I-420 North American Championships in Miami, Florida and fourth overall finish at the I-420 at Kieler Woche (“Kiel Week”) in Kiel, Germany. Horowitz is up for Yachtsman of the Year after finishing first at the J/22 World Championship in his hometown of Annapolis, Maryland. The East Coaster also won the Flying Scot North American Championship in Rockwall, Texas and finished second at the Viper 640 North American Championship in Kingston, Canada. Smith was Railey’s counterpart in 2006, winning the Yachtsman of the Year award that year. He finished ahead of the pack at the J/70 World Championship at Marblehead, Massachusetts. He also finished first at the Helly Hansen NOOD Regatta. The third Yachtsman of the Year finalist is Welles, who won his second J/24 World Championship (Italy) in five years. He was also the runner-up at the J/24 North American Championship in Charleston, South Carolina. A panel of sailing journalists and past winners will review the finalists’ credentials and select a winner in February. The final honorees will be recognized at a luncheon on Feb. 28 at the St. Francis Yacht Club in San Francisco. The two winners will be presented with specially engraved Rolex timepieces. U.S. Sailing has recognized the country’s top male and female sailor since 1961; Rolex became the presenting sponsor in 1980. The prestigious yachtsman and yachtswoman of the year awards have been presented to 44 men and 35 women. Several sailors have won the awards multiple times, such as Ed Adams, Sally Barkow, Dave Curtis, Allison Jolly, John Kostecki, Jan O’Malley, Ken Read, Anna Tunnicliffe and Ted Turner. Visit rolex.ussailing.org for more information about the top U.S. Sailing honor.